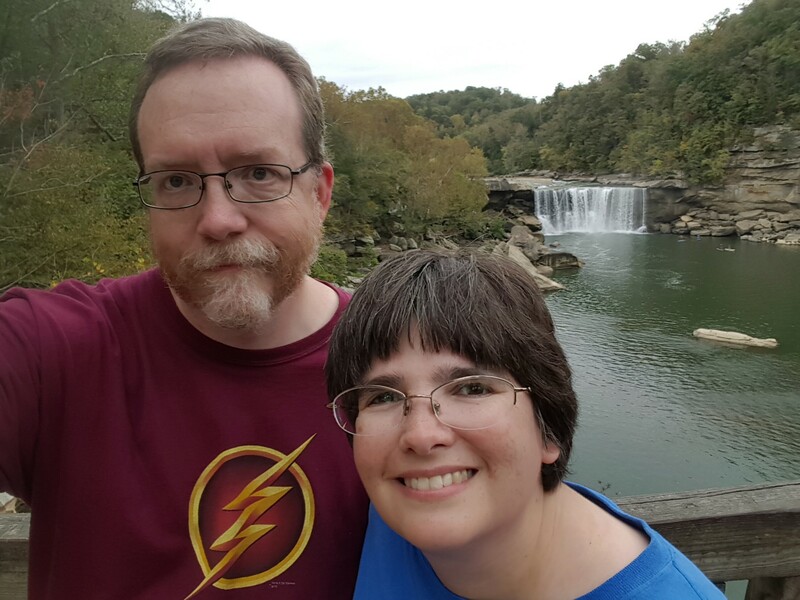 Cumberland Falls in the Fall « Midlife Crisis Crossover! 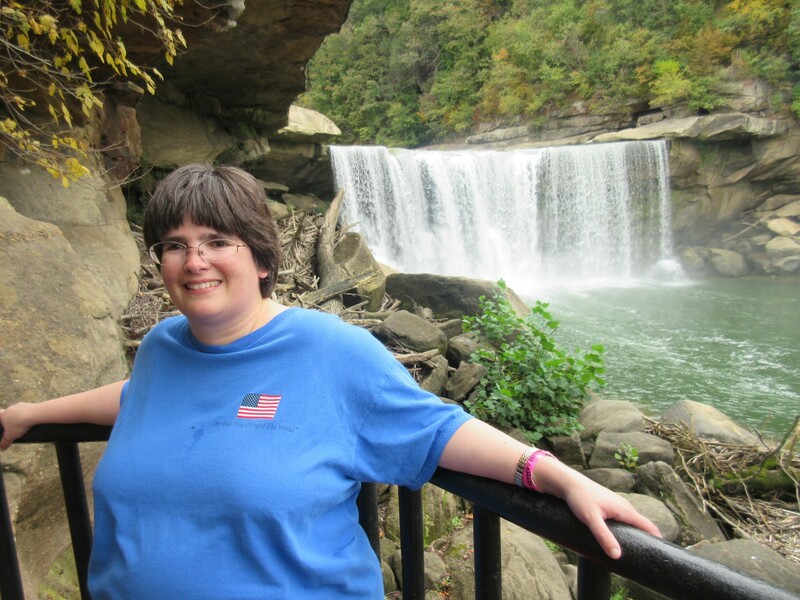 Our lovely spokesmodel Anne welcomes you to “the Niagara of the South” according to the locals! 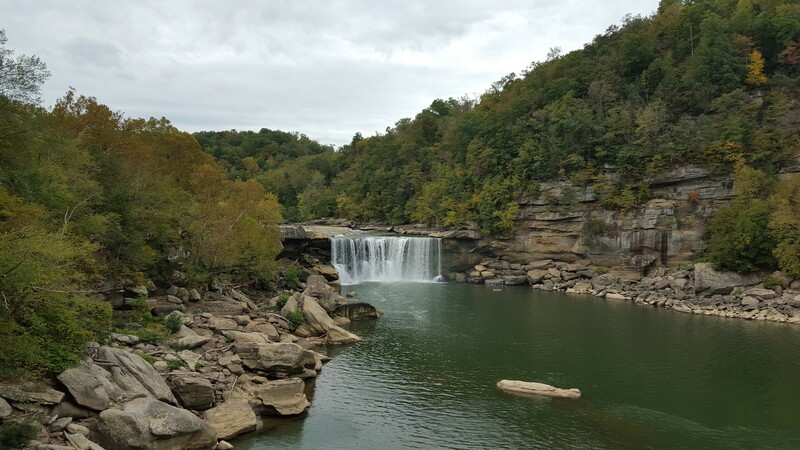 …and a few stops in Kentucky on the way back. 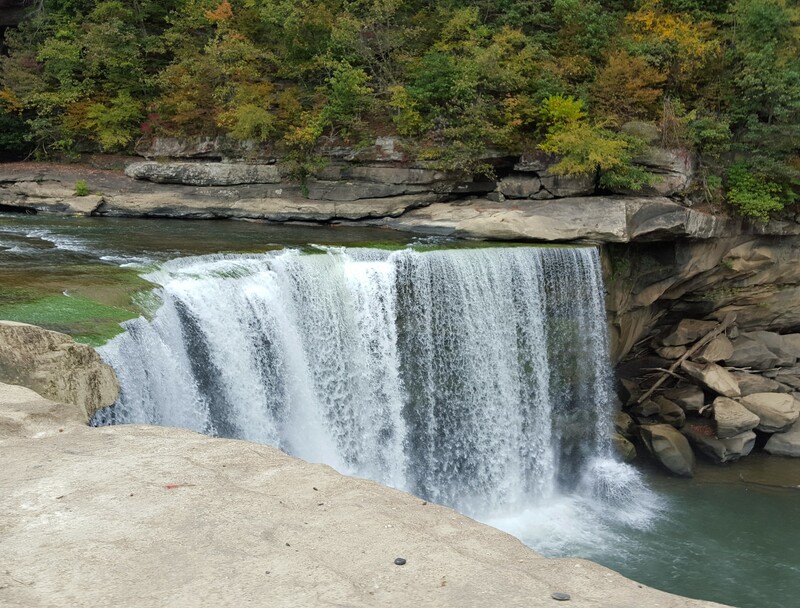 Our first one required a twenty-mile detour off I-75, but the scenery and fresh air were worth the extra mileage and twisty roads. It was also interesting from an automotive engineering perspective to test how tightly my car can handle country forest curves. Well, interesting to me if not to Anne. Cumberland Falls State Resort Park is well off the beaten path, but dozens of visitors were already swarming the place when we arrived on this late October afternoon. Admission is free, outdoor recreation options are diverse, parking is ample if you don’t mind a bit of a jaunt, and the visitors’ center has free Wi-Fi with a range of about five feet beyond its walls. Not sure if the walking stick collection is for sale or merely on display. 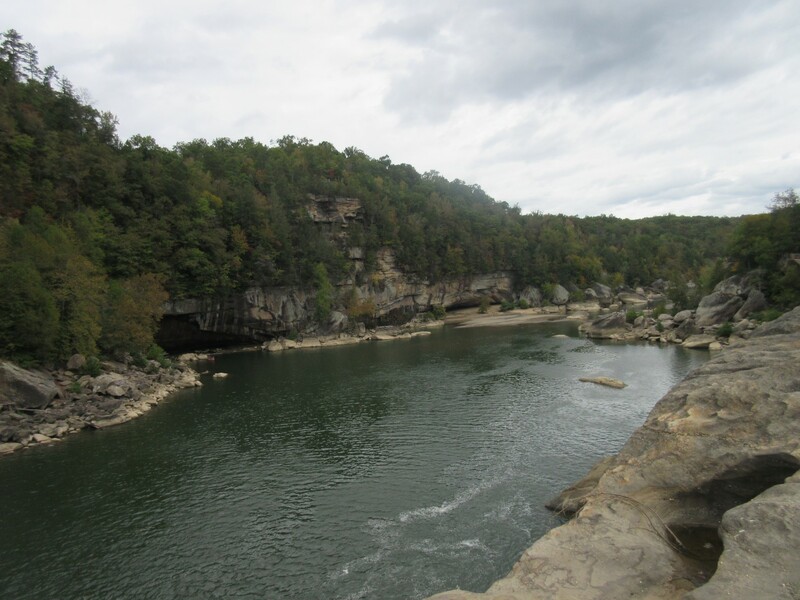 Most parking spaces are along the Cumberland River leading northward to the falls. Much of the riverside is navigable via awkward stairs that are not exactly ADA-friendly. Sights to look forward to along the way include countless trees, sandbanks, natural storm damage, and other people’s pets. 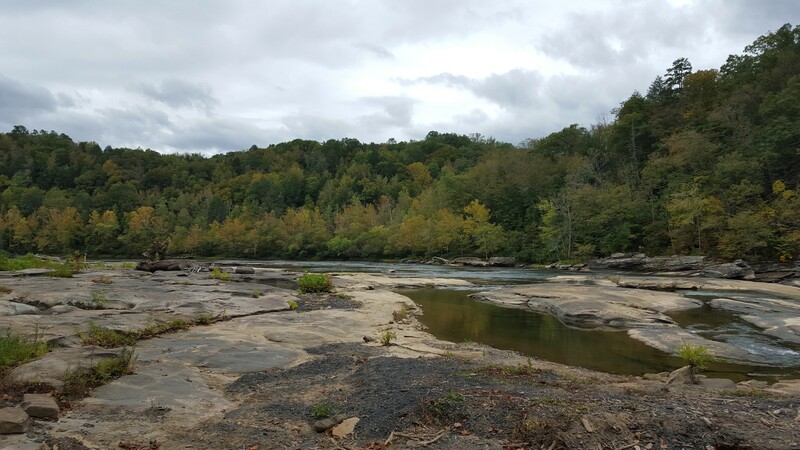 So much sandstone and so many other rock formations are showing that one has to wonder if the river is — or used to be — normally much higher. 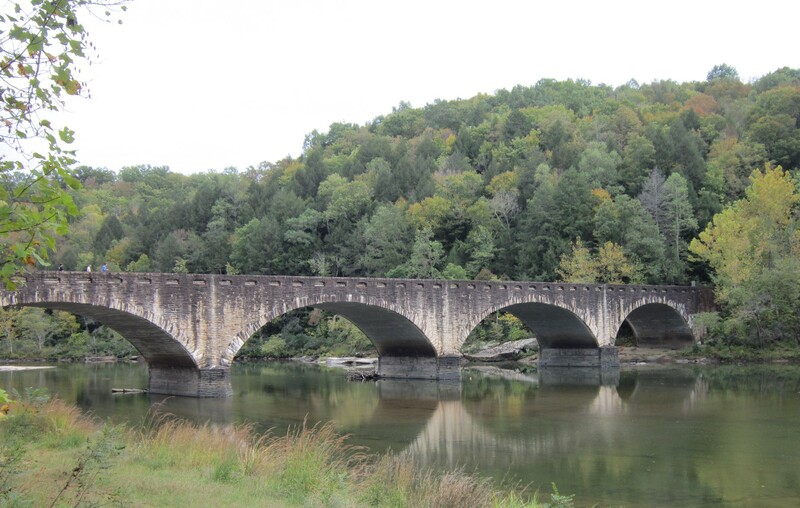 Farther south, Kentucky Highway 90 crosses via the Cumberland Falls Bridge, built in 1954. 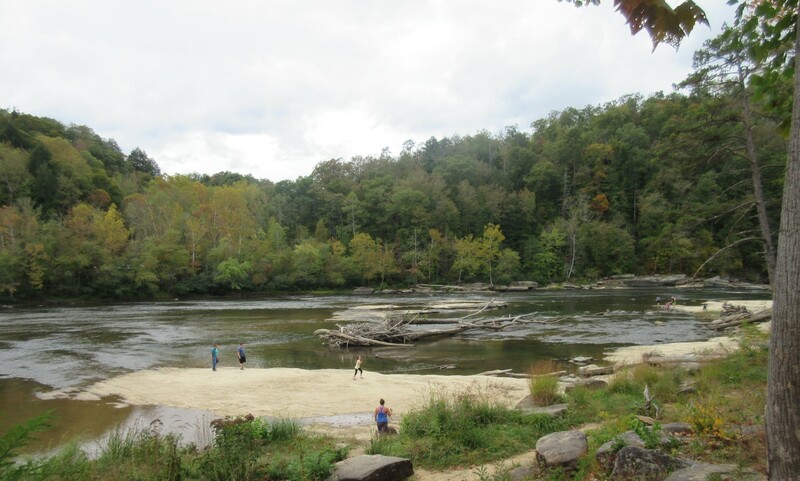 Eventually nature makes way for the feature presentation, Cumberland Falls — 125 feet wide and 68 feet high, one of the larger American waterfalls ranking not far below Niagara. White-guy accounts of the area date back to at least 1750, but the Shawnee, Cherokee, Chickasaw, and Creek nations have known it quite a bit longer. 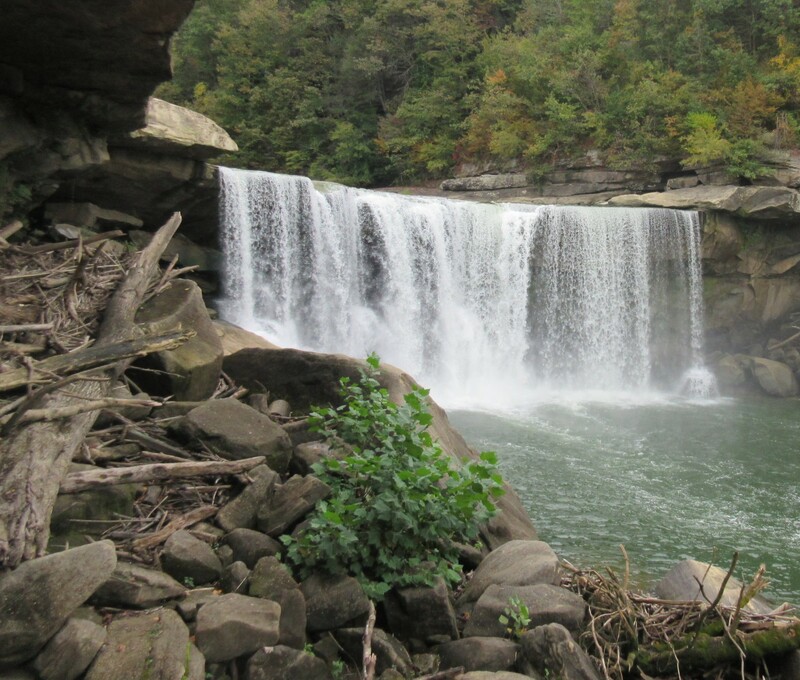 It’s been owned by the Commonwealth of Kentucky since 1930 and an official state park since 1931. And it looks cool. A series of rocks leads out from the official viewing deck, past a nominal iron-bar fence and toward the Falls themselves, but bypassing the fence will attract the attention of park rangers who aren’t afraid to use their sirens and megaphones to corral stray looky-loos. It’s hard to blame folks for wanting to get closer — it can be hard to get a good look from the off-to-the-side vantage at the highest point of the walkway, especially when the crowd is in your way. 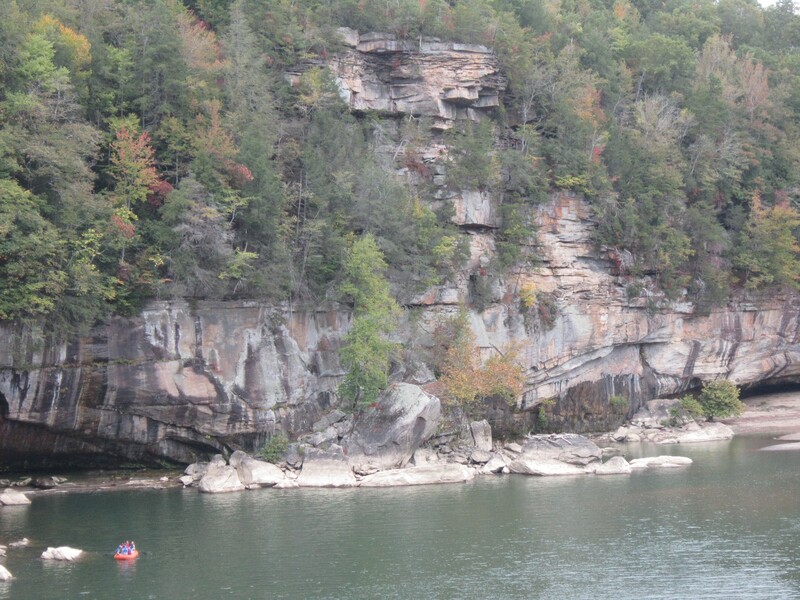 The cliff on the other side of the Cumberland River. Down below you can make out one among several groups of boaters approaching the falls for a close-up. The river continues north, away from its prettiest feature. We walked a bit farther and found that one branch of the trail descends and doubles back toward the falls, providing alternative photo opportunities for the persistent. Mandatory panorama with the Falls as centerpiece. The closest we could get without watercraft or invoking park ranger wrath. Now you can see all the detritus Anne was blocking in our lead photo. Our selfie moments are rare, but we took several turns trying our hand at it. This was the best of the lot if you ignore the part where I was concentrating so hard on composition that I forgot to smile. Shots like this are why I will never, ever rank among the 100,000 greatest bloggers of all time. But my wife thinks I’m cool!